This year offering Oahu Full Conference Registration Scholarship and Neighbor Island Travel Scholarship! 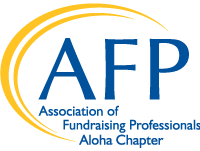 The Association of Fundraising Professionals Aloha Chapter will offering a limited number of Full Conference Registration scholarships for Oahu applicants and travel stipend scholarships for Neighbor Island travel to the 2018 National Philanthropy Day Conference and Awards Luncheon, to be held at the ‘Alohilani Resort (formerly the Pacific Beach Hotel) on Thursday, November 15, 2018. We are pleased to offer this scholarship opportunity in an effort to broaden our professional development to members of our fundraising community both on Oahu and the neighbor islands.